A sharp and provocative new essay collection from the award-winning author of Freedom and The Corrections. 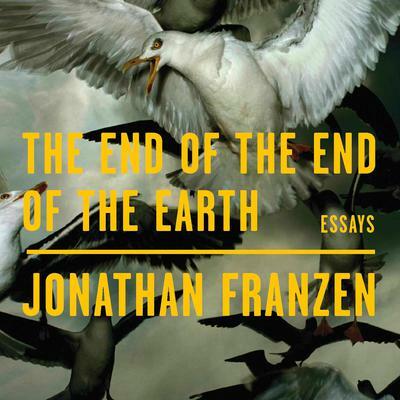 In The End of the End of the Earth, which gathers essays and speeches written mostly in the past five years, Jonathan Franzen returns with renewed vigor to the themes—both human and literary—that have long preoccupied him. Whether exploring his complex relationship with his uncle, recounting his young adulthood in New York, or offering an illuminating look at the global seabird crisis, these pieces contain all the wit and disabused realism that we’ve come to expect from Franzen. Taken together, these essays trace the progress of a unique and mature mind wrestling with itself, with literature, and with some of the most important issues of our day, made more pressing by the current political milieu. The End of the End of the Earth is remarkable, provocative, and necessary. Jonathan Franzen was previously known for his influential Harper’s essay, “Perchance to Dream.” He is now the author of several novels and multiple works of nonfiction, all receiving industry recognition. He splits his time between New York and Santa Cruz, California.